Erected by Friends of Thrall, Library Centennial Committee. Location. 41° 26.79′ N, 74° 25.135′ W. Marker is in Middletown, New York, in Orange County. Marker is on Orchard Street just east of North Street, on the right when traveling east. Touch for map. 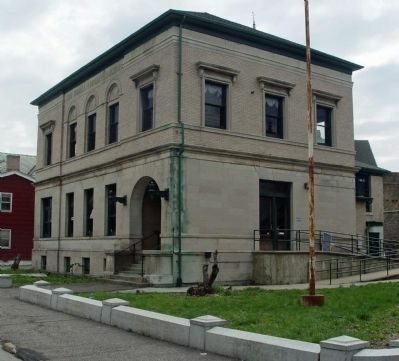 Marker is at or near this postal address: 22-24 Orchard Street, Middletown NY 10940, United States of America. Touch for directions. Other nearby markers. At least 8 other markers are within walking distance of this marker. Grace Episcopal Church (within shouting distance of this marker); "Fireman Joe" (about 300 feet away, measured in a direct line); First Congregational Church (about 400 feet away); Erie RR Station (about 400 feet away); Hotel Site (about 700 feet away); Edwin Welling VanDuzer Memorial Home (approx. 0.2 miles away); Vaux Landscape (approx. 0.3 miles away); The Calvert Vaux Entranceway to Hillside Cemetery (approx. half a mile away). Touch for a list and map of all markers in Middletown. More about this marker. Marker is laying against the side of the building on the handicap access ramp. 2. The former Thrall Library Building. More. 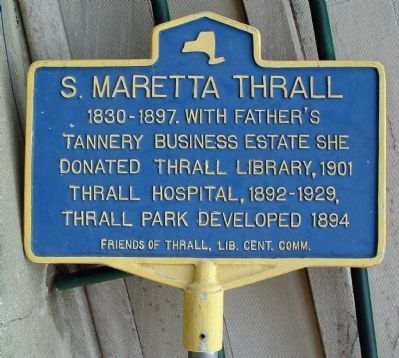 Search the internet for S. Maretta Thrall. Credits. This page was last revised on October 3, 2016. This page originally submitted on April 9, 2010, by Clifton Patrick of Chester, NY, United States. This page has been viewed 921 times since then and 10 times this year. Photos: 1, 2. submitted on April 9, 2010, by Clifton Patrick of Chester, NY, United States. • Bill Pfingsten was the editor who published this page.